Heat oven to 325 degrees F. Arrange wonton wrappers on work surface. Evenly brush tops of each with butter. In small bowl, mix together sugar and cinnamon. Sprinkle about 1 teaspoon sugar mixture over each wrapper; press lightly to make sugar mixture adhere. Carefully transfer each wrapper to a cup of an ungreased muffin tin; press down to form a cup. Bake 8 to 10 minutes or until golden brown and crisp. Remove from pan; cool on wire rack. Meanwhile, fan strawberries by cutting 4 to 5 slices into each, cutting 3/4 of the way through. Lay strawberry on its side; press down gently to fan. Set aside. 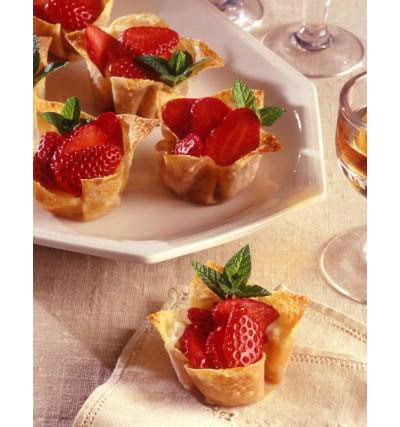 In small bowl, mix together mascarpone cheese, honey and Grand Marnier; spoon scant tablespoon into each wonton cup. Garnish with strawberries and mint, if desired.